As an expressionist landscape artist, Ali strives to capture her emotional response to a place as opposed to the nature of it’s physicality. The most crucial element for her is the mood and atmosphere. Working mainly from memory, Ali creates the pure essence of her response to the world around her. 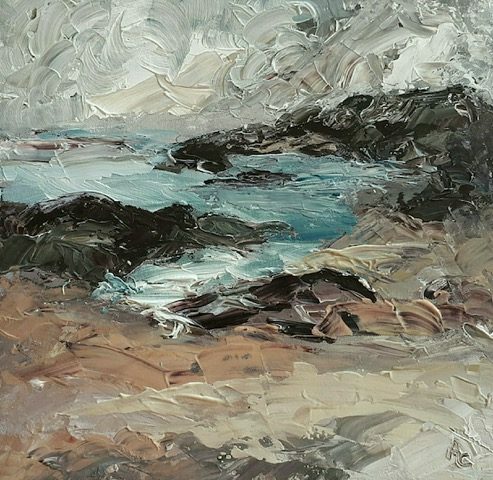 As well as taking inspiration from the Cornish countryside she is continually drawn to the sea. Applying layer over layer, blending, adjusting tone, colour and contrast, forming shapes until they become meaningful, Ali continues to work until the painting ‘feels’ complete. This might mean that a small painting can absorb many hours of tweaking and adjustment whilst a larger piece comes together effortlessly. Spontaneity is crucial for her as it creates the energy and captures the spirit of the piece. It is the uniqueness of each journey of construction and creation that keeps her painting. She hugely enjoys the roller coaster of ups and downs as a painting ebbs and flows to its final destination.